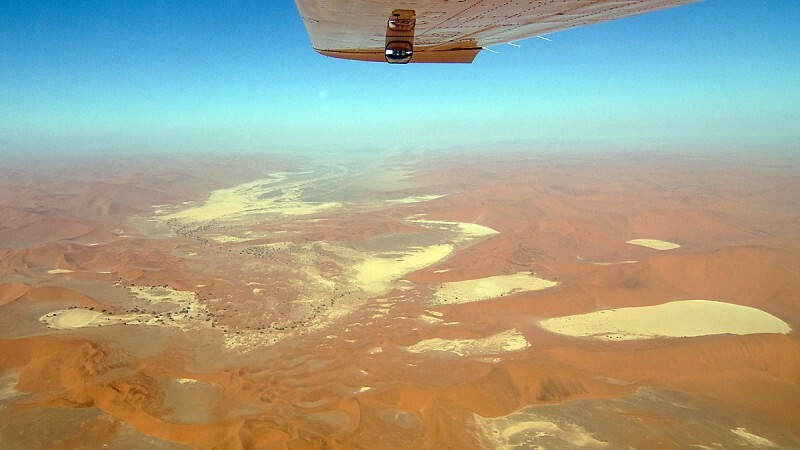 We continued our flight south, leaving the Kuiseb Canyon behind us. 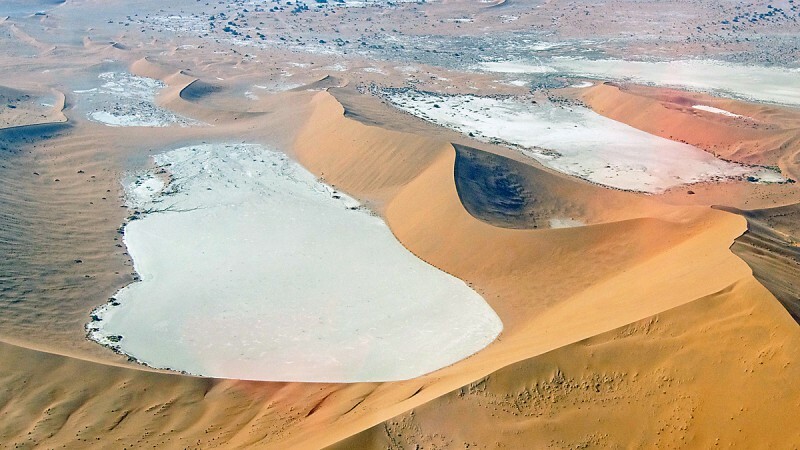 The Namib Sand Sea is on UNESCO’s World Heritage List since June this year and it is unique in many ways. 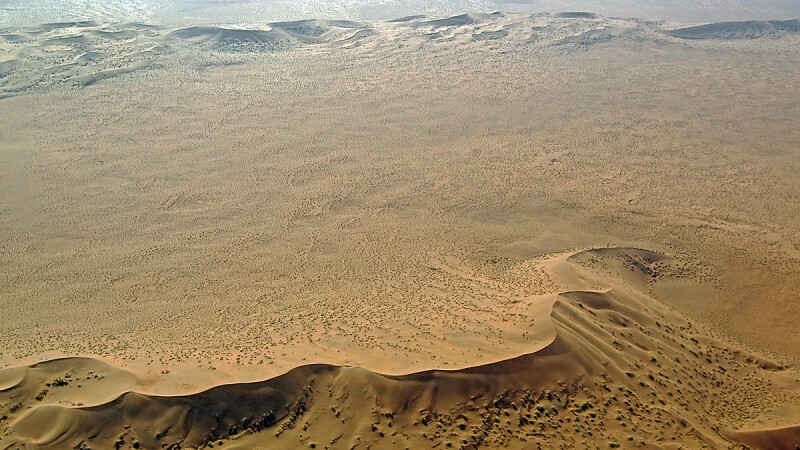 It is the only coastal desert in the world that includes extensive dune fields influenced by fog. 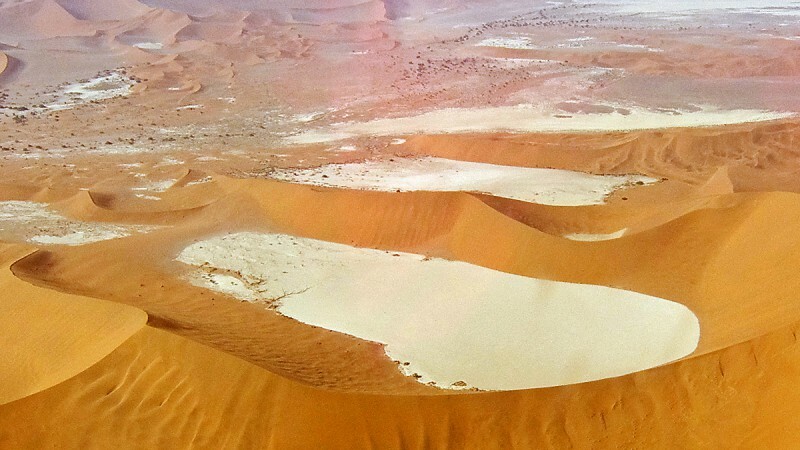 It is composed of two dune systems, an ancient semi-consolidated one overlain by a younger active one. 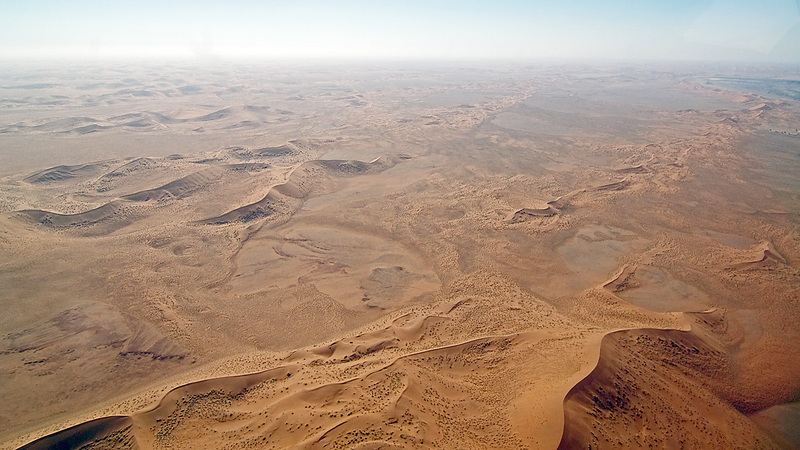 The Namib Desert is the oldest desert in the world. 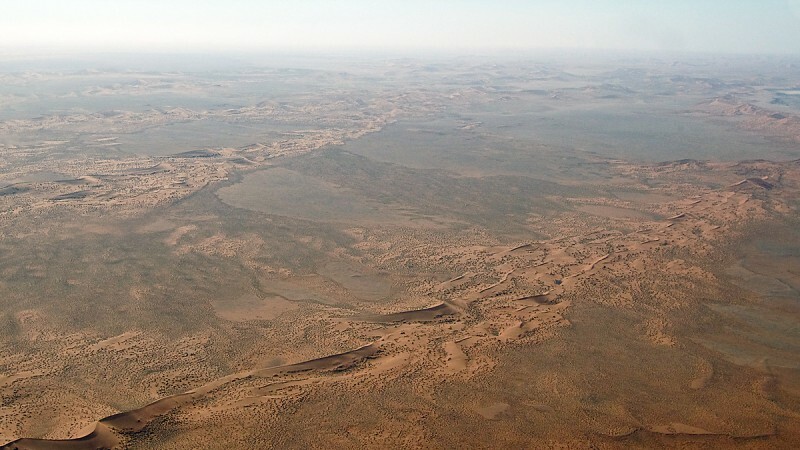 South of Solitaire is the Tsondab River seen above. It almost never receives much rain but still large camelthorn and umbrella-thorn trees grow along its meandering banks. Seasonal rain periodically cause the water to flow to the end of the vlei. This is an important breeding area for lappet-faced vultures and no visitors are allowed here. Fog is the primary source of water in Namib Sand Sea, accounting for a unique environment in which endemic invertebrates, reptiles and mammals adapt to an ever-changing variety of microhabitats and ecological niches. The pictures above are all looking to the west. 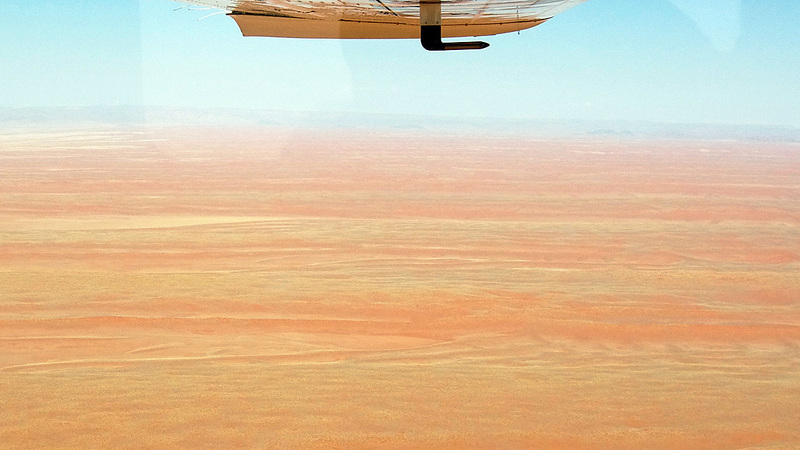 Looking to the east are instead these plains, painted in pink, yellow and green. 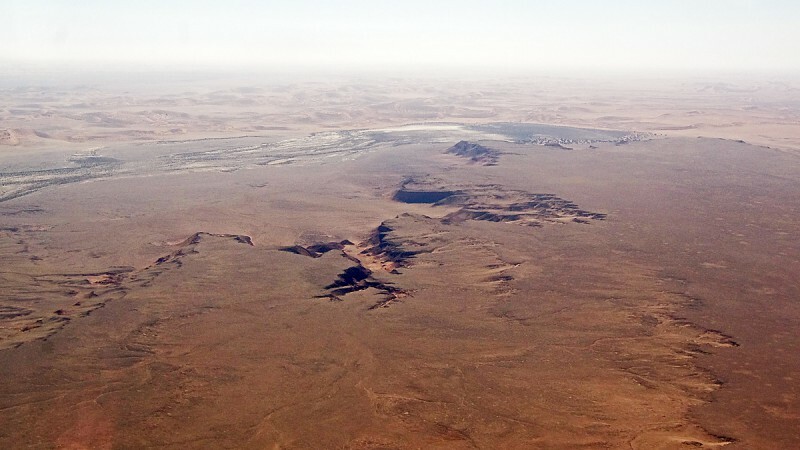 Somewhere in the distance is the road from the Gamsberg pass south to first Solitaire and then Sesriem. 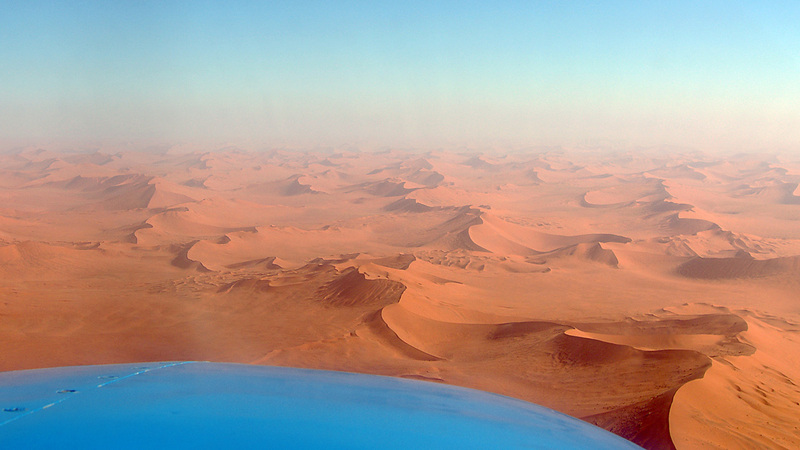 …we saw the red dunes in front of us and knew we were approaching our next target. 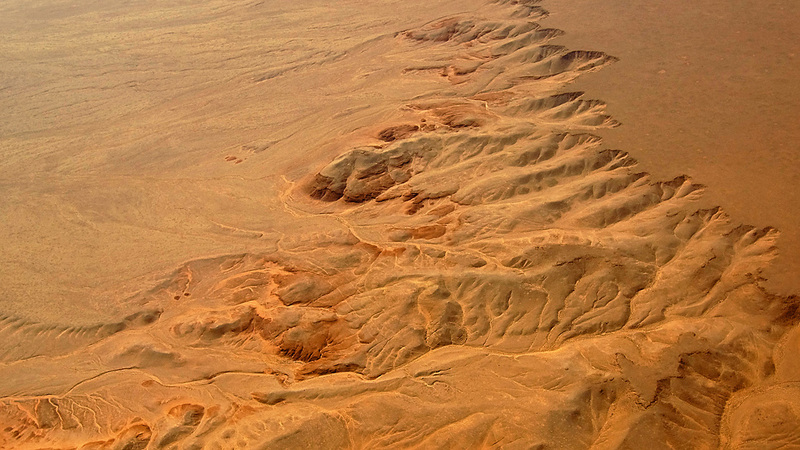 From Sesriem and its Canyon, the Tsauchab river flows east in a plain between parallel rows of enormous sand dunes. 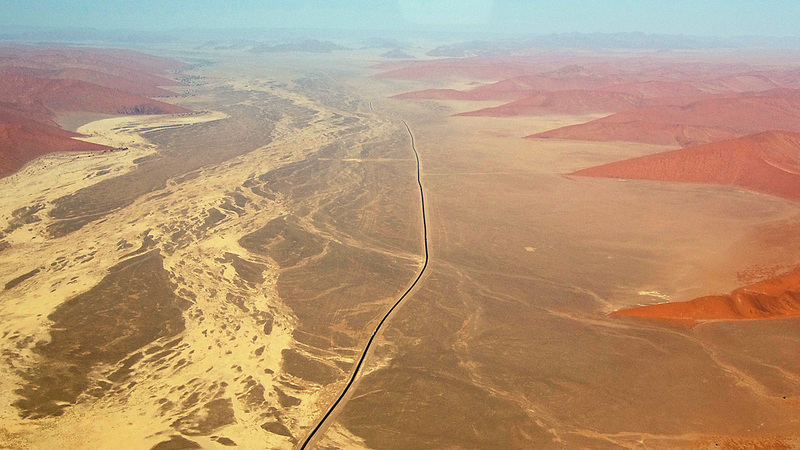 The black line is the tarred road that help tourists to move from the lodges and camps near Sesriem to the Sossusvlei area. 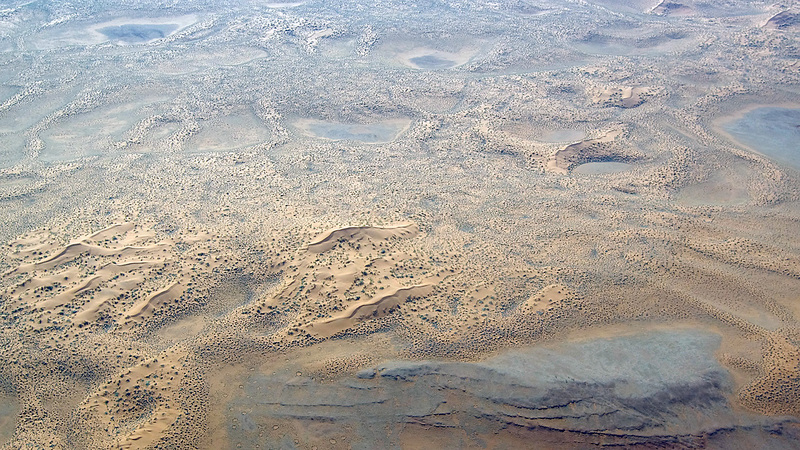 The Tsauchab river is flowing towards the coast but is stopped by the dunes and evaporates here leaving white clay deposits in sharp contrast to the red sand. Above, in the middle of the picture is a round white spot. 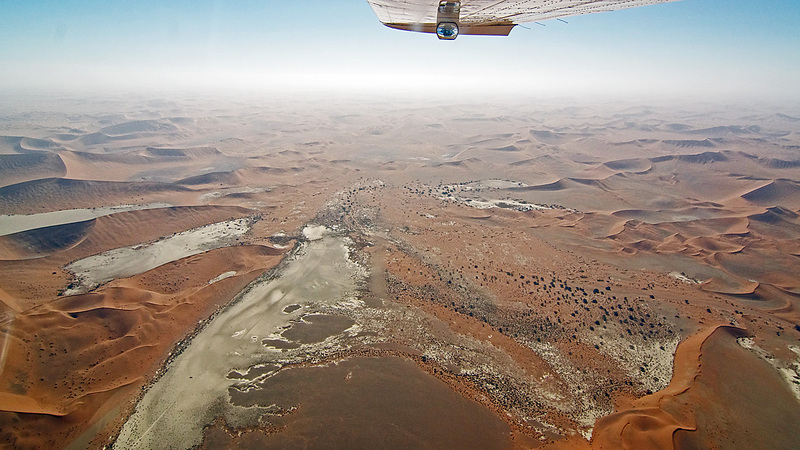 It is the Sossusvlei where the river ends and it has been a lake on my two visits here but is now all dry. 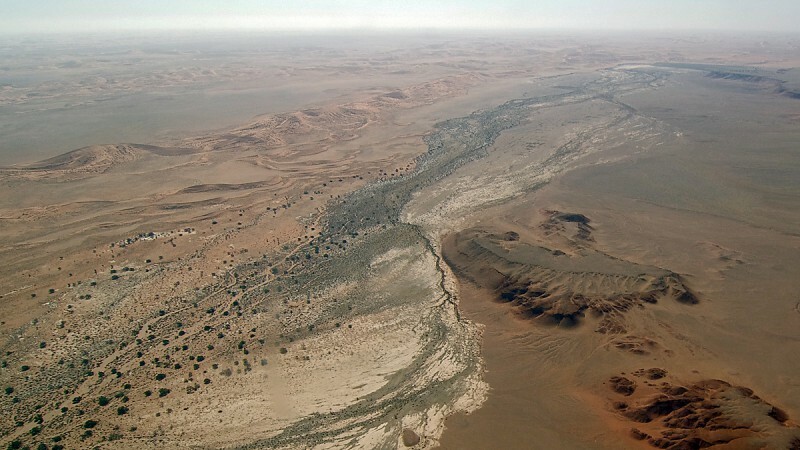 A thousand years ago the river instead ended here, in what is now known as “Dead Vlei”. The white clay is the remains of a lake and here you also find the dead forest, thousand year old dead Akacia trees. Bottom right is the “Big Daddy” perhaps the highest sand dune in the world with a top of some 325 metres. 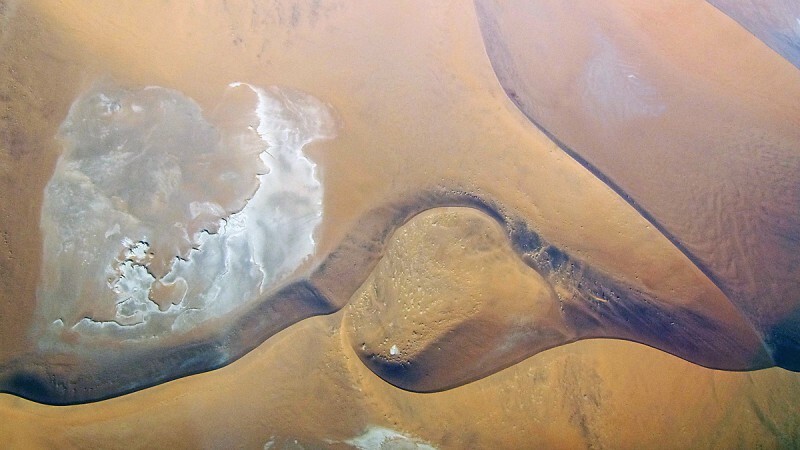 Looking straight down you find a lot of strange, but beautiful shapes like in the picture above. 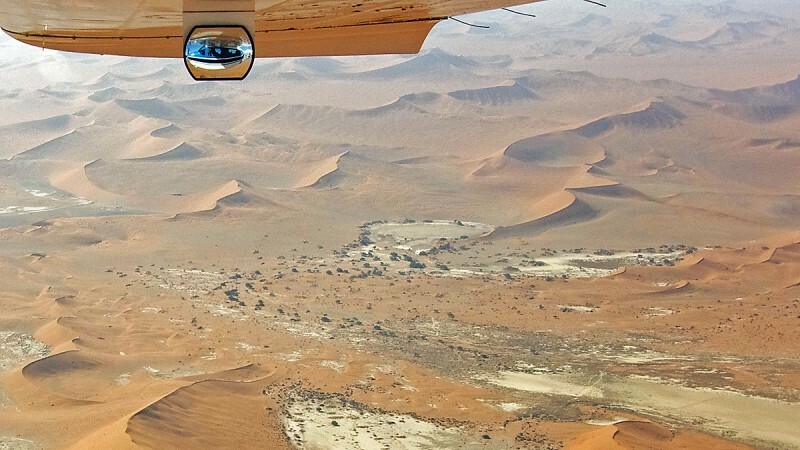 A last look towards the east over the Sossusvlei area. To the left Sossus Vlei, to the right Dead Vlei and somewhere in the distance Sesriem. …but the text will be in Swedish.